No more dark circles under your eyes now as Cosmotree Clinic is at rescue. Cosmotree offers best treatment for dark circle in Delhi. Cosmotree Clinic offers a variety of treatment that can remedy the condition, and do not require much hassle. Age-related under eye circles and issues that result from other causes, however, typically require cosmetic treatment from a qualified cosmetic clinic like Cosmotree Clinic in Delhi. • Daily use a moisturizer with sunscreen. • A healthy and balanced diet with lots of iron and vitamin K.
• Apply daily, with focus on the under eye area. ingredients include chamomile and vitamin E.
Though creams are just temporary resorts as they provide short term results and not very effective too. the skin’s surface, causing them to fade from view. done. Usually, results appear slowly. sensation or stinging during treatment. • Might have some swelling or discoloration, which will fade in a few weeks. • They can reduce the appearance of prominent veins and capillaries. • Through exfoliation, abrasion and shedding of the superficial skin cells without scarring. • The most frequently used peels for dark circles are Arginine and Lactic acid peels. • Other peels like Glycolic acid (15 to 20%) with Kojic acid also give good results. 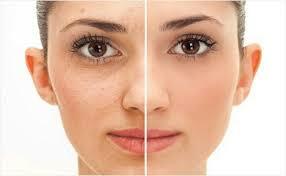 • Glycolic peels can often help to reduce the appearance of dark circles. • Majorly, glycolic peel aids in reducing the amount of pigmentation and improving the rate of collagen production. • However, it cannot alone result in getting rid of dark circles completely. layers of skin to reveal new, healthier skin. Cosmotree Clinic combines Glycolic peels with other treatments to help in a more effective way in the process of getting rid of dark circles. Counseling and post peel maintenance are very important in treating dark circles with a chemical peel. Cosmotree Clinic will offer you the best treatment for dark circle in Delhi as per your skin and body needs. appearance of dark under eye circles. • The translucent skin will now rest on yellow or clear filler above the muscle. • Hyaluronic acid filler has also been shown to start collagen production where it is been injected. • Temporary filler usually needs to be reinjected every six to twelve months. • Q-switched laser and ablative CO2 laser resurfacing can be used. if new blood vessels regrow there in the next five to ten years. • Three to five laser treatments are usually required. Cosmotree Clinic will examine your problem and will offer you the best treatment for dark circles and eye-pufffiness. • Offers best dark circle treatment in Delhi. • Offers excellent post-care along with great customer care service. • Cost-effective with desired results in minimum time period. If you’re looking for the best treatment for dark circles, Cosmotree Clinic in Delhi is the place to come. Cosmotree Clinic is at your rescue making available to you the best dark circle treatment like Laser, Chemical Peels, and Fillers etc. Our highly trained and experienced specialists will provide you with the best treatment to meet your cosmetic goals, and we’ll do our best to keep you comfortable every step of the way. Give us a call at 9999909292 to schedule a consultation today. • You can choose to pay us in a single go or in 2-3 installments.